A major Middle East airline says the ban on large electronic devices on flights from the region is a waste of time. In a move that caught the aviation industry by surprise, President Trump's administration last month banned passengers from carrying anything larger than a smartphone on some flights to the U.S., citing security concerns. 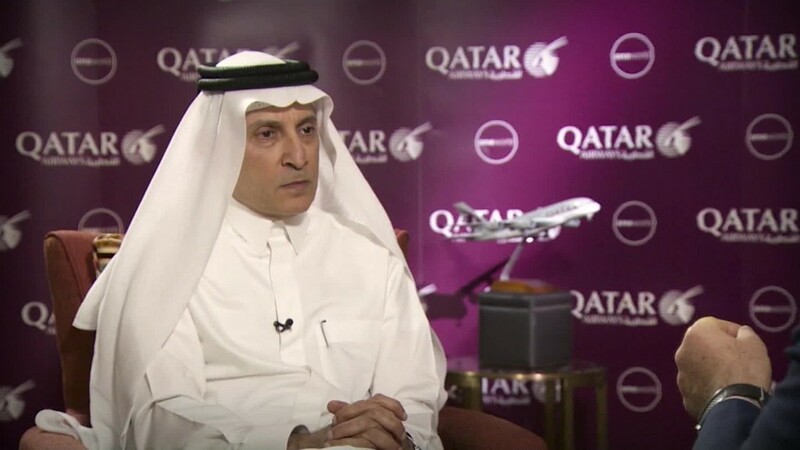 "I didn't think this ban was necessary at all," Qatar Airways CEO Akbar Al Baker told CNNMoney. "People who want to disrupt aviation will do it from other places where there is no ban." He said the restrictions were rushed and introduced without "proper discussion." "If [Trump] continues this way, at the end of the day you will have people sitting in the airplane with underwear and nothing [else] on them," Al Baker told CNNMoney's Emerging Markets Editor John Defterios. "I don't think this is really the correct way of solving security problems. In today's day and age, we have so much advancement in detection systems that we should utilize them." Qatar Airways has seen a drop in bookings as a result of the ban, which targeted nine airlines flying direct to America from the Middle East and North Africa. "Yes, we have had a drop in passengers but it's a manageable drop and people have started to realize that there are other ways to use laptops," Al Baker said. The fall in bookings was less than 10 per flight, he added. Passengers on those flights now have to check in their laptops and tablets or hand them in at the gate for stowing in the hold. A few days after the ban was introduced, the airline said it was offering loaner laptops free to business-class passengers. The other major Gulf carriers hit by the ban, Emirates Airline and Etihad Airways, have introduced similar measures to try to protect their premium passengers. The U.K also hit airlines with an electronics ban on flights from some countries in the Middle East and Africa. But Qatar Airways and the other big Gulf carriers were not affected by the British ban. That has fueled concerns among some business leaders in the Middle East that the U.S. ban may be aimed at disadvantaging Gulf carriers who are accused by their American rivals of benefiting from huge government subsidies. Emirates President Tim Clark told CNNMoney last month he didn't believe the U.S. was using security concerns as cover to tackle commercial issues. The airline said it supports more than a million U.S. jobs through its flights to the U.S. and orders of Boeing (BA) jets. Al Baker, too, said his airline supports the U.S. economy by buying American and investing there. "We are today living in a globalized world and you really cannot close your doors," said Al Baker. "Trump is not a nationalist, Trump is a pragmatist. He is looking after America first and we are supporting him in America first."